Bar mitzvahs, and bat mitzvahs for girls, are key moments in the lives of those who practice Judaism. But for one Howard Beach man, a bar mitzvah was elusive — for more than seven decades. Karl Birenbaum was due to celebrate his bar mitzvah in Radom, Poland in January 1940. But a few months earlier, Germany had invaded Poland and Jewish residents were forced to go into hiding, or were rounded up and taken away. The onset of the war forced the cancellation of the then-13-year-old’s Bar mitzvah. The war was not easy for Birenbaum. The young teenager was forced to endure the hardships of the Nazi regime and lost both his parents during the Holocaust. He eventually immigrated to the United States where he married and started a family. His wife, Janet, passed away last summer. 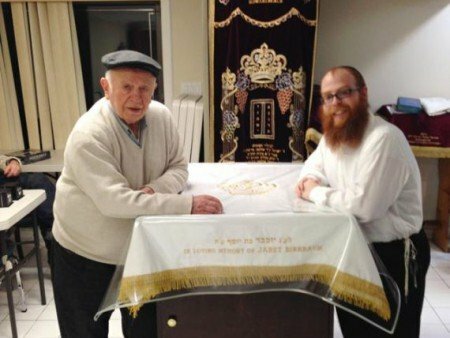 It was just a few months ago that Birenbaum, now 87, mentioned to Rabbi Avrohom Richter of Chabad of Howard Beach that he had never had his actual bar mitzvah. Richter sent out an email to the community stating that this past Sabbath was exactly 74 years to the day since Birenbaum would have had his bar mitzvah and that all were invited and encouraged to attend this important event. Birenbaum was not told about the plans so the congregation could surprise him. At the celebration, Birenbaum was called to the Torah and was showered with candies as is the custom and everyone broke out in song “Mazal Tov.” A Kiddush lunch — a meal consumed before the end of Shabbat — was served. The community came together and bought a Torah altar cover in honor of the bar mitzvah. The cover is dedicated in the memory of Janet Birenbaum.